These baby shower decorations will make your day extra special. It’s no secret baby shower decorations make a shower complete. Sure, there are other components like menu, invitations, and location, but the shower decorations are what will set your special day apart. They're what will be captured in all the pictures taken at your baby shower, after all, so you want them to be picture perfect. 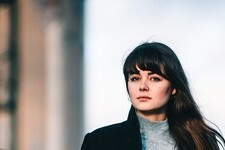 With so many different baby shower theme options available, you want to choose something mama-to-be has a personal connection with — it's her day, after all. Shower decorations come in many different shapes and forms these days, so this is your opportunity to get as creative as you want (or as simple as you want!) and make the day memorable. 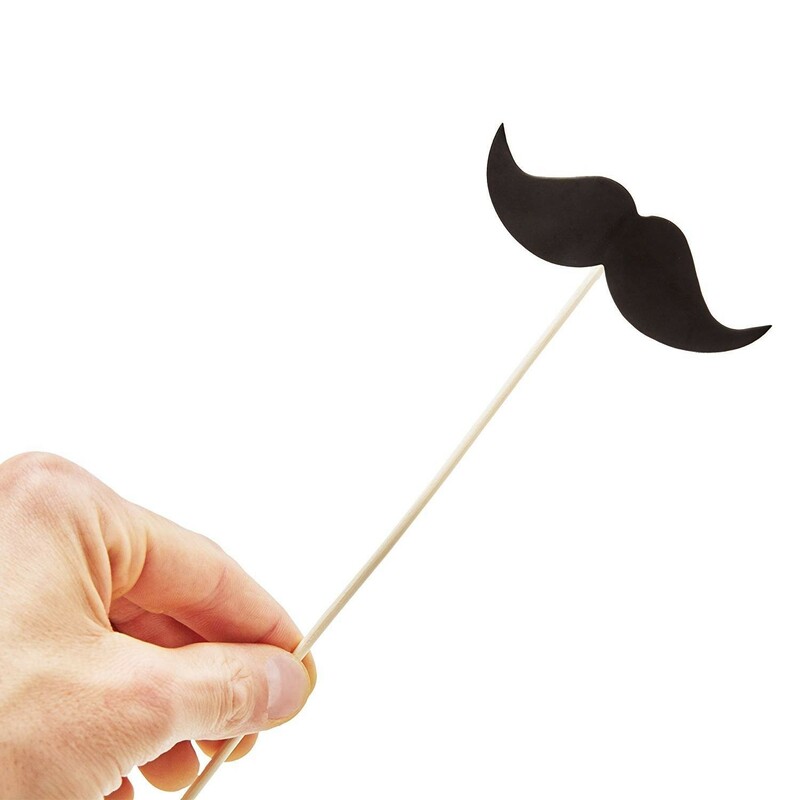 Since social media is the epicenter of everything, don’t forget to include photo props! Once you've narrowed down your favorite baby shower theme options, you should choose decor that'll back up that theme. There are so many options to choose from. And, who doesn't love options? Obviously, when you're pregnant, the last thing you want to do is run around from party store to party store looking for these decorations — nothing about that sounds fun at all. So what sets our list apart from others? Every item you find here can be found on Amazon and ordered with the swift click of a button. If you have the Amazon app, you don’t even have to pick up your computer — all your ordering (not to mention your baby registry) can be done in the palm of your hand. How's that for simple, mama? There is something extra special about your guests going home with a favor that they will cherish and remember. 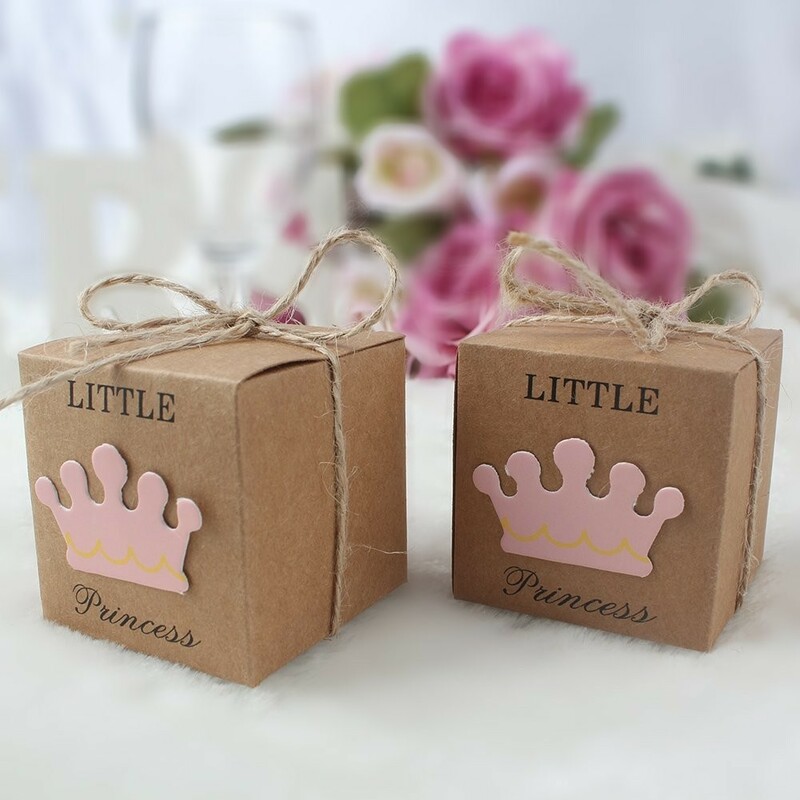 These adorable Little Princess Baby Shower Favor Boxes are just that and will match perfectly with any pink decor you are planning. They have enough space to hold about six pieces of chocolate or something the equivalent size and the gold foil metallic details with the twine bow make this truly standout. If choosing something to fill your sweet boxes with has your brain spinning, there are so many different unique ideas here that your guest will actually want to keep after your shower is over. And if you are having a boy, these favor boxes also come in the Little Prince option. 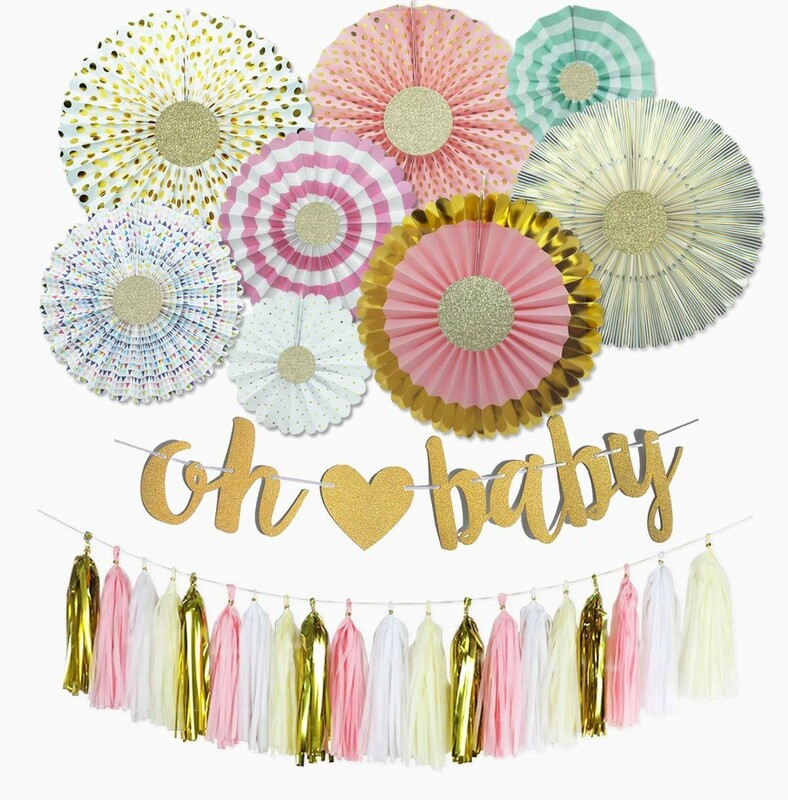 One of the easiest ways to add a little bit of fun to your baby shower is to add tassels in a wide array of colors. Coming in options for both boy or girl themed baby showers, this Tassel Kit is a great way to get your party started! These can easily be strung from the table, ceiling or wall, to create a beautiful focal point for your baby shower decorations to build around. 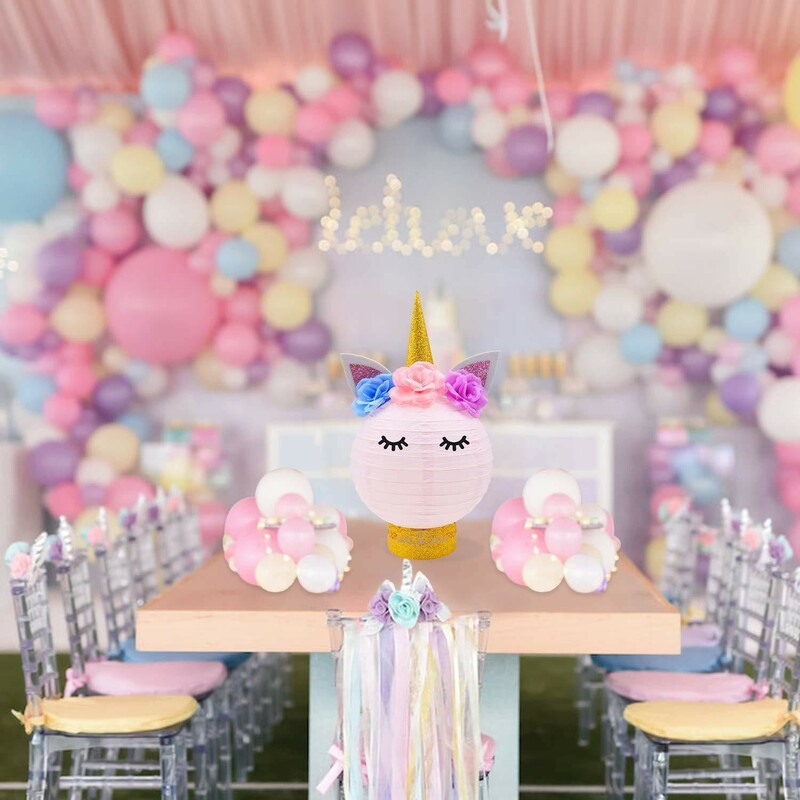 We all know how popular unicorn everything (some people are even calling it Unicorn Fever) is for baby showers these days and this Unicorn Centerpiece will really up the ante on the magical decor at your baby shower. They are created like paper lanterns, however, you do have the option to set them on tables for a typical centerpiece or to hang them from the ceiling — wherever works best for your special day! Now all you need to add are some purple, pink and blue streamers and your decoration shopping is pretty much complete. 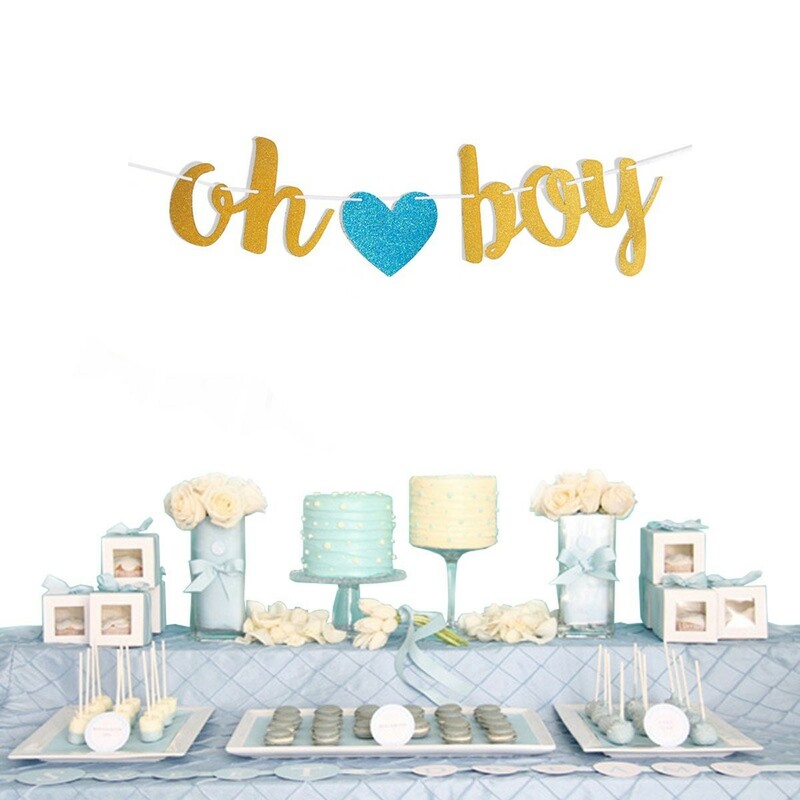 If you have a little boy on the way, what could be sweeter than this "Oh Boy" banner? Pretty much nothing! Made out of Eco-friendly paper, which is important for our environment, it truly sparkles. These glittering letters with a blue colored heart in between are strung neatly on a white ribbon and will have all of your guests swooning. This can sweetly be displayed on the door as your welcome sign whenever your baby shower guests arrive, or inside on the wall. As we mentioned before, having the right photo props might make or break your baby shower. Social media is important these days, as is having an Instagram-worthy baby shower, so these props will be a fun addition to your party. This combination of everything boy in the Baby Shower Photo Prop Bundle will help you and your friends and family create the perfect environment for hilarious, memorable photos. Including everything from silly glasses to the perfect mustache, these pictures will hit social media with a bang. Whenever you're planning a special event like a baby shower, it's important to pay attention to all the decor details — right down to the napkins. 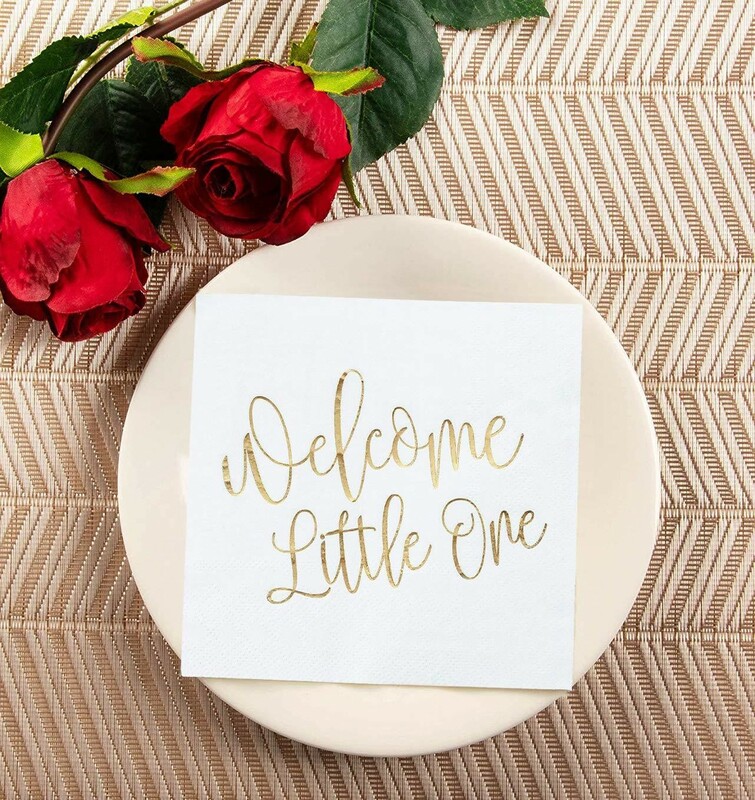 These adorable "Welcome Little One" Napkins are a great gender neutral addition to your baby shower. And as an added bonus: not only do they look beautiful, but they are highly absorbent three-ply and extremely functional, too. It's well-known that whenever you get invited to a baby shower that there will be cake... or at least delicious cupcakes. This can easily be argued as the most important part of your baby shower. While selecting the right cake or cupcakes might be difficult with all the amazing options out there, choosing what to go on top should be easy. We are loving these "Oh Boy!" Cupcake Toppers because they not only look fantastic but take the dress off of needing to get to a special or overly expensive bakery. They are a wonderful way to jazz your baby shower up! 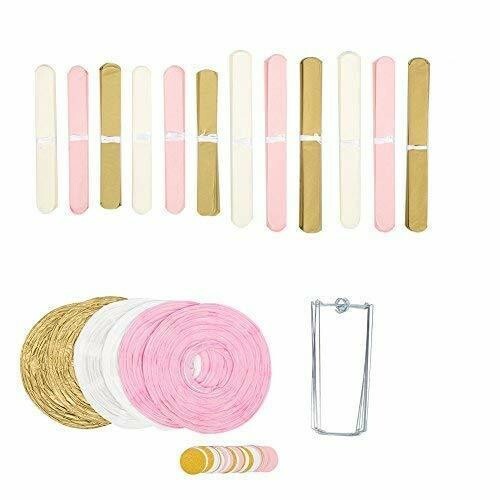 This beautiful, nineteen piece kit comes with every piece of whimsical gold and pink little flowers and lanterns that you could want or need to add a little burst of beauty to every corner of your baby shower venue. The muted tones of this Baby Shower Decor Kit are just lovely, without overdoing it! If you are having an outdoor shower, these also work great outside, just be careful not to get them wet because they are made from paper. Every baby shower is in need of a little balloon fun and what could be cuter than big shiny letters? These balloons are very elegant and made from a high-quality mylar foil material and twelve inches in height. The "Oh Baby" Balloons are durable, long lasting and pretty much won't pop unless you want them to. With the ability to be hung from branches outdoors or against the wall, they are the perfect addition to your baby shower decorations. But, they are so much more than just decor! 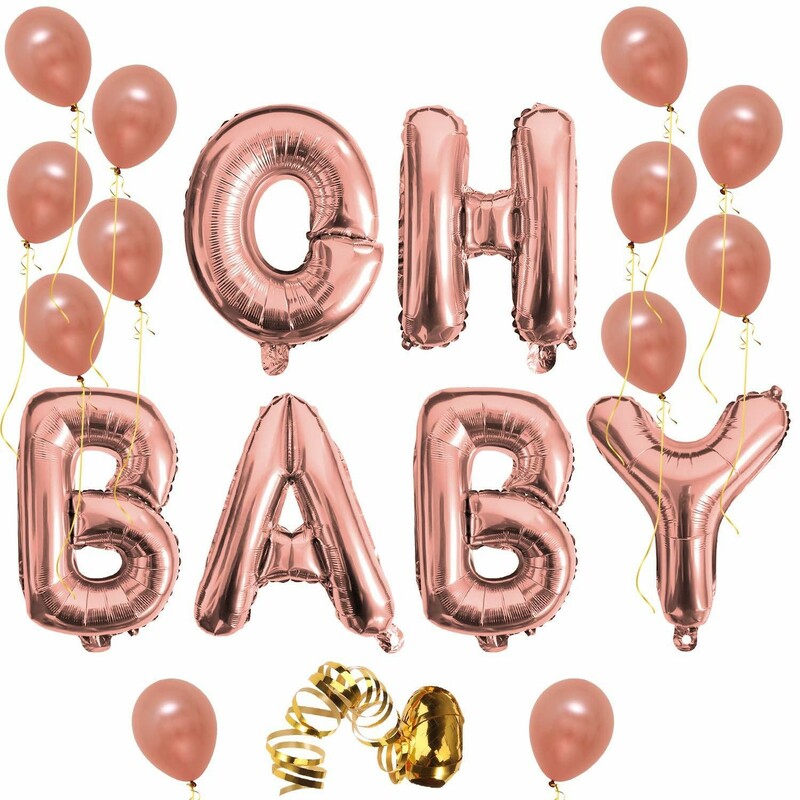 These balloons are also the perfect photo prop for your baby shower as there are so many hilarious uses for them. 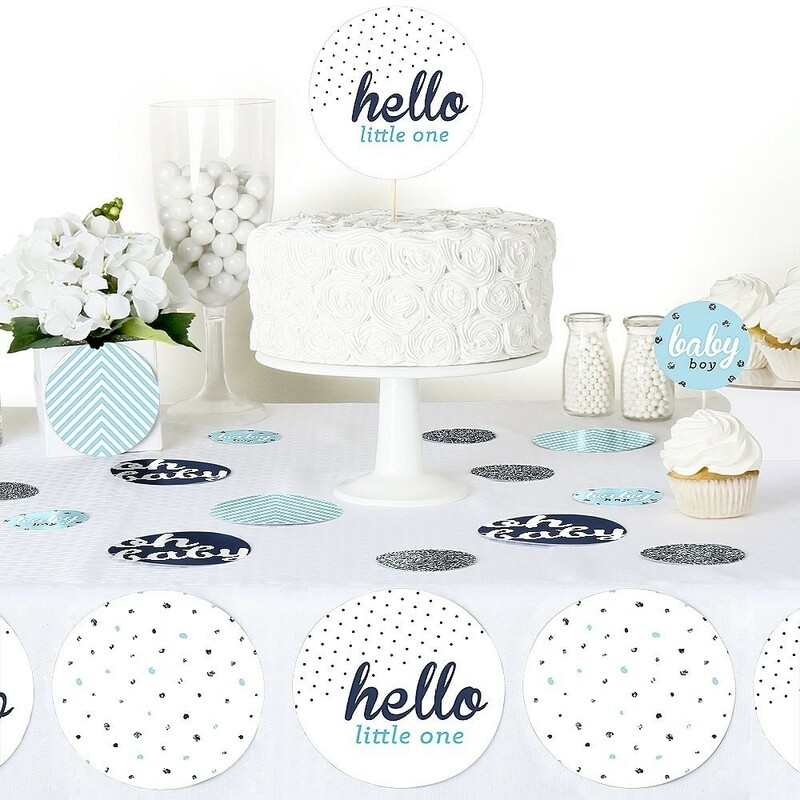 One of the easiest ways to add an extra touch to your baby shower decorations is by sprinkling fun Table confetti all over the tables where either the guests are sitting or food is served. In fact, it's pretty much the easiest part of decorating for your baby shower! These are super modern, featuring a mixture of polka dots and crisp chevron lines, and will surely make your special day even more chic. Details, detail, details. It's all about having the right details to make sure that your baby shower decorations flow and most importantly, are memorable for your special guests. These precious straws are so dainty, they are fit for a princess — pretty much the equivalent to a mommy-to-be. There are so many ways to be creative with paper straws, too, and incorporate them into a lot of fun DIY projects that will make your decor pop even more! 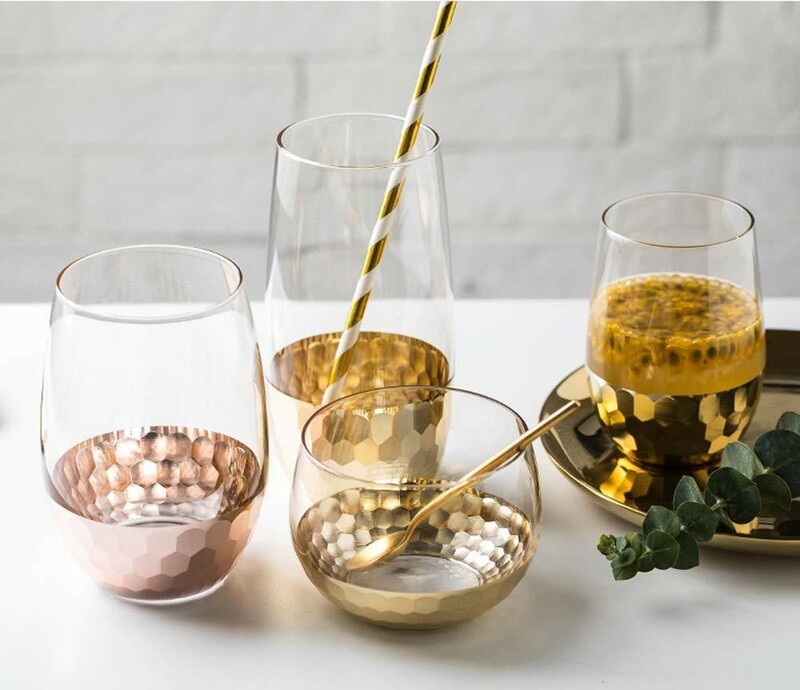 With one hundred straws coming in the pack and in mixtures of different pink and gold designs, you are sure to sip your drink like royalty. 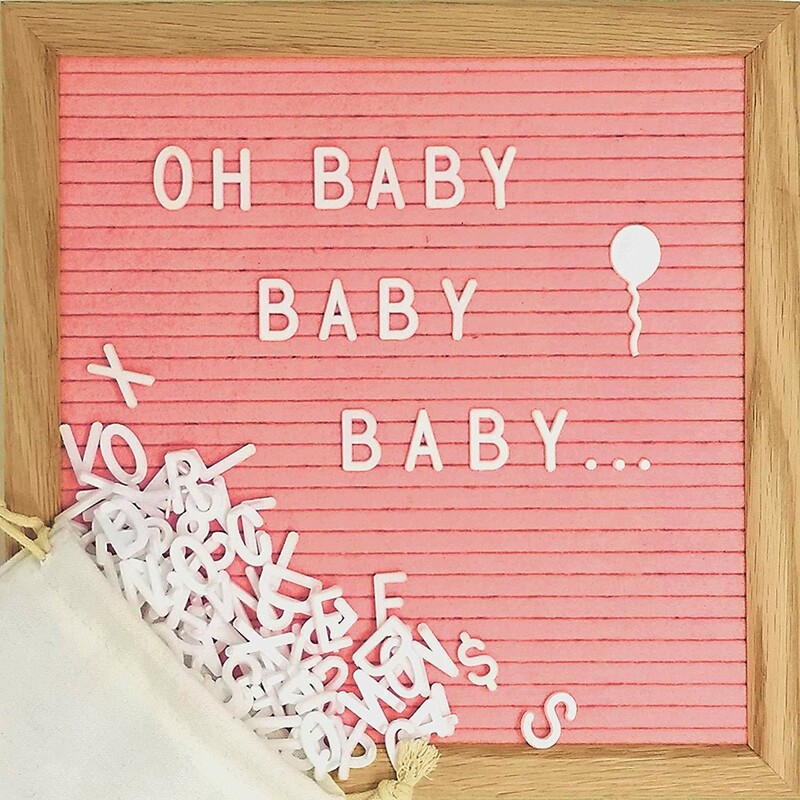 Speaking of wanting an Instagram-worthy baby shower, you'll make sure that you add this Pink Letterboard to your list of baby shower decorations for sure! With so many different options to write on the board, it really gives you the opportunity to get creative, or you can just keep things basic and include the date for memory's sake. Or, keep things interesting and let your baby shower guests switch up your baby shower message — the options for added fun are endless. And, if you're not sure what to write on your letter board, here are some fun ideas that will capture everything you are feeling about your pregnancy. 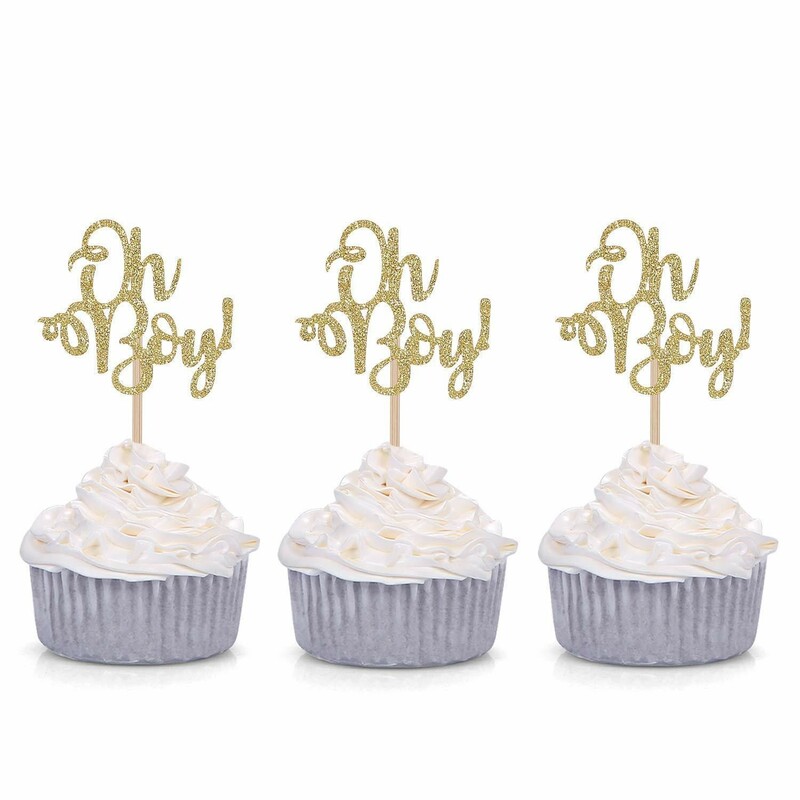 If you are planning a gender neutral baby shower, this sparkling gold "Baby" Confetti is a truly glamorous way to spice things up. Even though the cleanup might be a little bit more challenging, we think that it's worth it to have gold little "baby" words tossed all over the place for this special occasion. 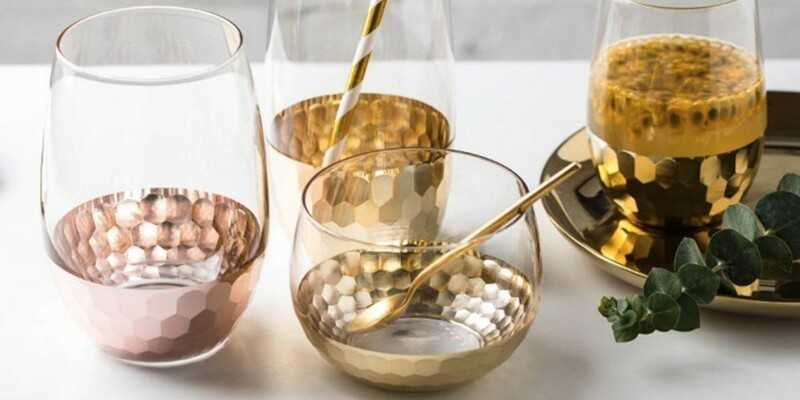 When planning a baby shower (or any event, really), gold is always the right answer! Whether you are trying to model a celebrity baby shower or do your own thing, this is some great inspiration. 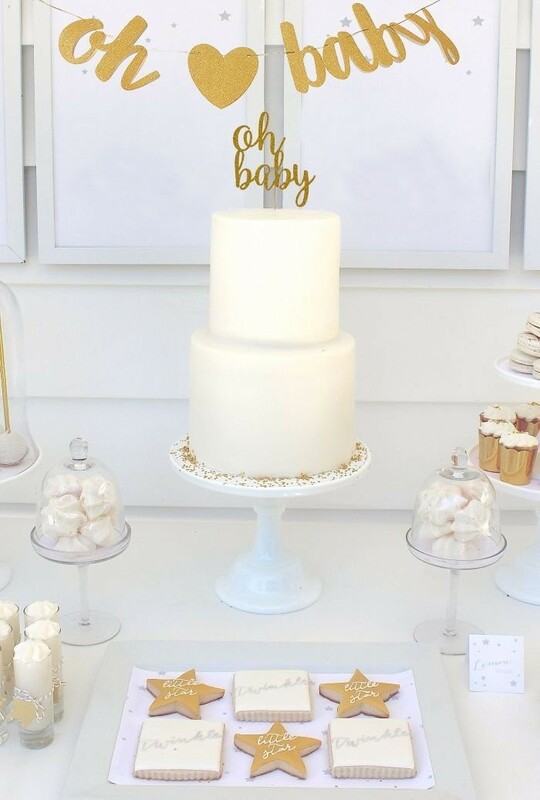 The Gold Baby Shower Kit pretty much comes with everything that you need to make your special day extra sparkly from balloons to cake toppers, banners and more. We think it's as glam as things could possibly get. You can't go wrong with a one-stop shop situation when you've got so many other things on your mind! 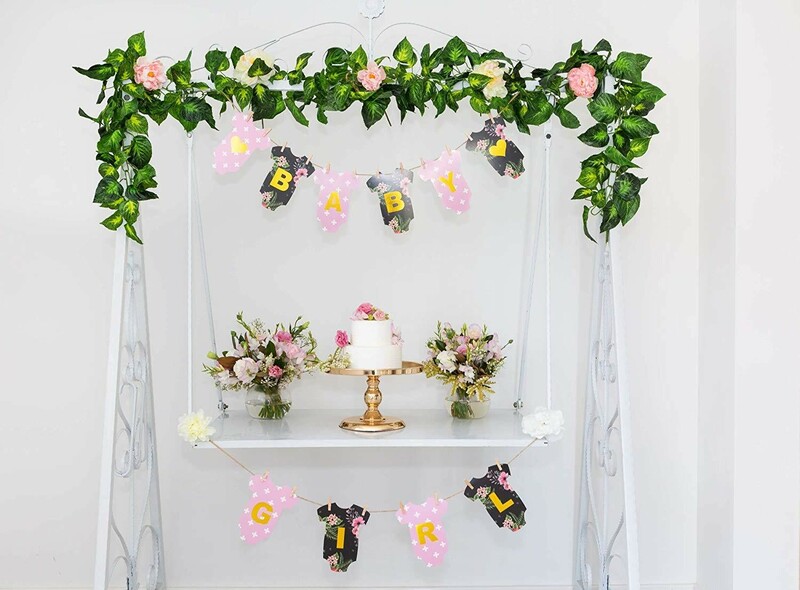 If you are looking to add a little extra touch to your baby shower decor, choosing a Paper Garland that matches with your color theme to hang from the ceiling is always a great option. 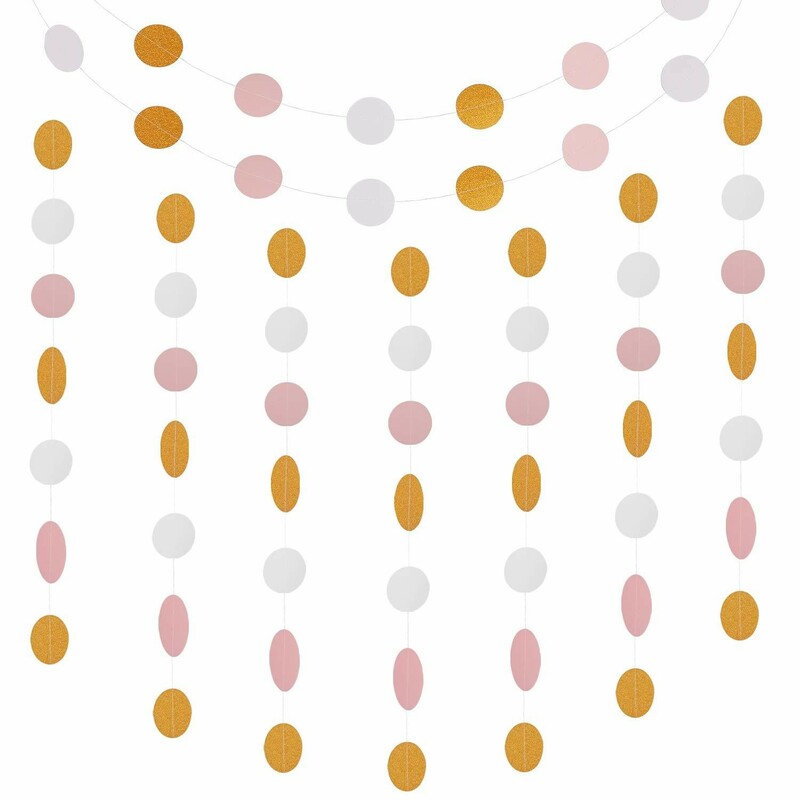 Hanging ten feet in length and coming in a wide array of colors, (and even some different shapes! ), it's sure to make your baby shower pop! Babies are pretty much the equivalent to onesies in everyone's minds. And how could they not be? They go through about five a day whenever they are newborns, after all. This super adorable Baby Onesie Banner emulates just that in the sweetest baby shower decoration way possible. Printed on high-quality cardboard and strung on jute rope, this will surely make your guests swoon. And after seeing these sweet cardboard onesies hanging from the ceiling or on a table, you're going to want to make sure that you also set up a DIY baby onesie decoration station so that your guests can make you all the custom onesies you can get your hands on! For all the mamas-to-be with a fun sense of humor who want to add some laughter to their baby showers, these "Soon to Pop!" 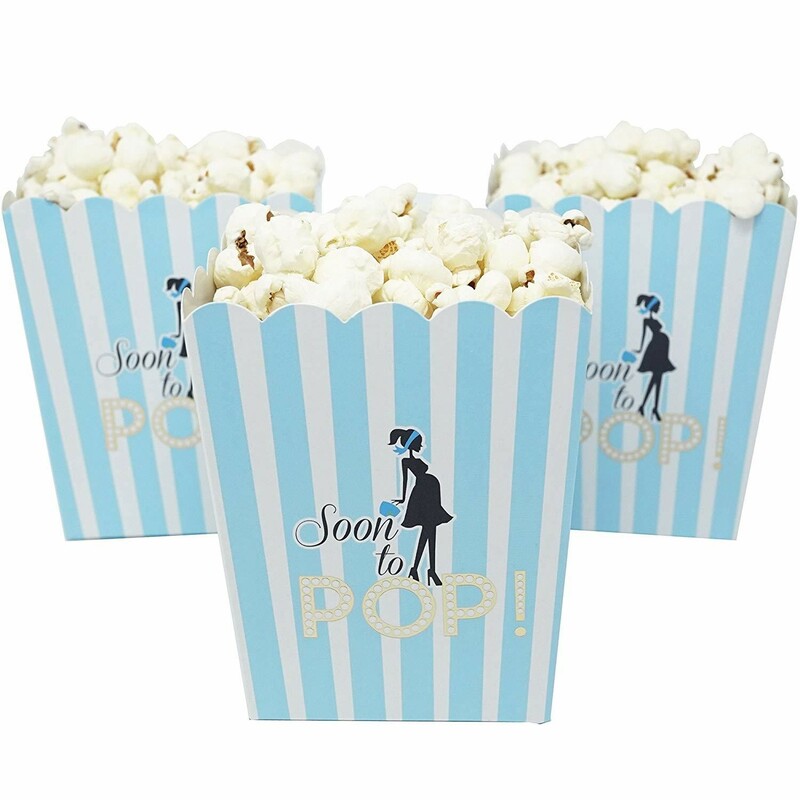 popcorn containers are the perfect addition to your food table decor at your baby shower! You will truly make a statement in the most chic way possible as your guests enjoy a special treat from these funny containers. All you need to do is to pop some popcorn and fill them up! Or you can always do a little bit extra and whip up some gourmet popcorn for your guests to enjoy. 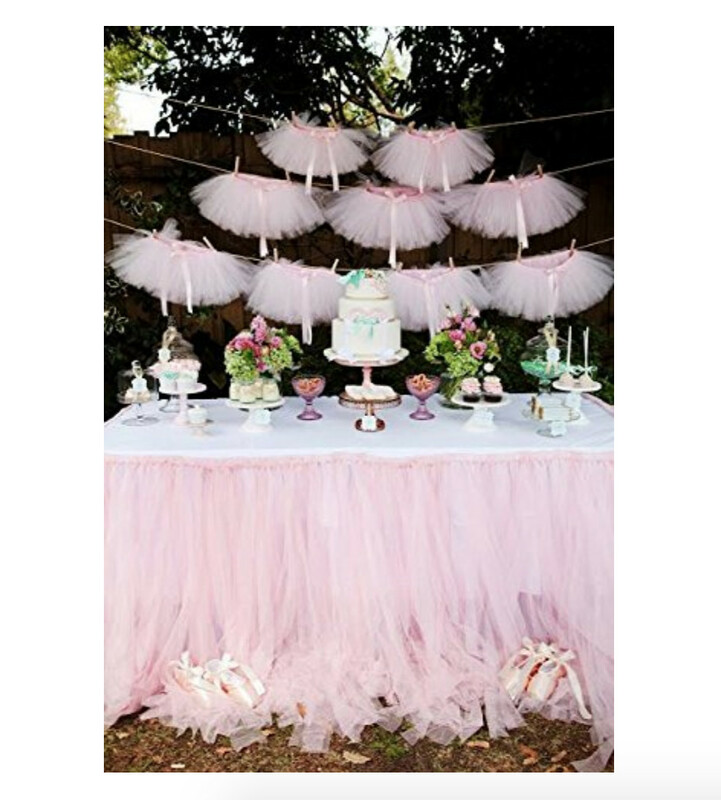 With many little girls having a big place in their heart for dance, these Tutu Tulle Table baby shower decorations are the cutest. Featuring nine mini tutus hanging from a string by clothespins, this is the most detailed and sweet garland that you will ever find for your baby shower. If you are not loving this idea of having the tutus hang, they can also be detached and used to wrap mason jars or flower vases — whatever works best with your decor! And if the mom-to-be was a dancer herself, adding some of her old pointe shoes or ballet slippers to the decor will make it all extra personal. 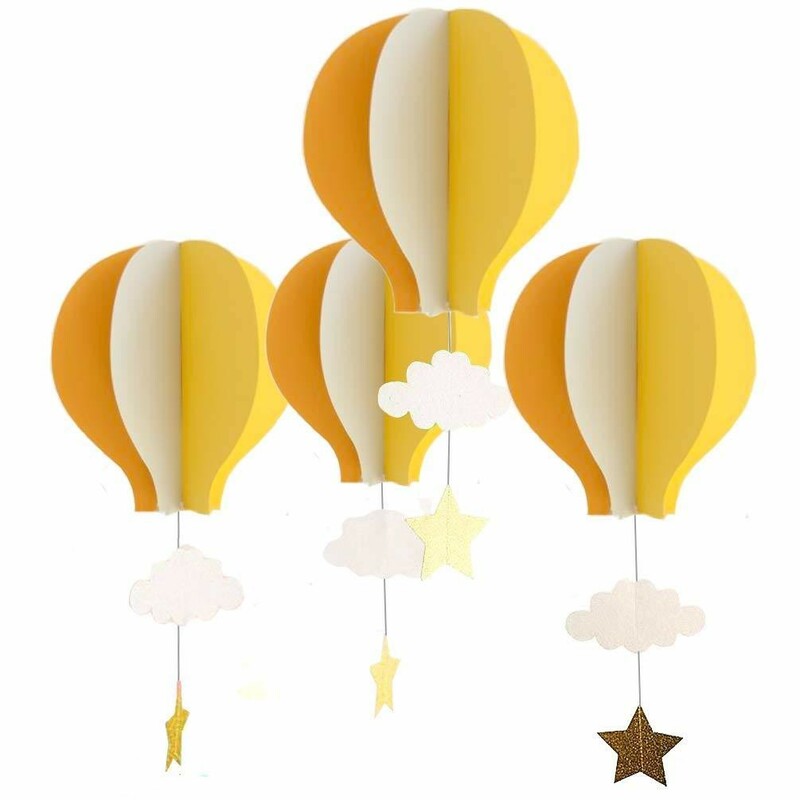 With hot air balloons being a very popular gender neutral baby shower theme, we are swooning over these Hanging Hot Air Balloons in different shades of gold and orange with hanging stars and clouds. They come in a set of eight and are large enough to catch the eyes of all your party guests as they watch in awe at how truly unique and beautiful each hot air balloon is. Each hot air balloon can easily be hung from the ceiling or incorporated into your decor in a different way. They could also be used as a prop in one of your fun baby shower games. We hope you love these products! Just so you know, Mabel + Moxie may collect a share of sales from the links on this page.